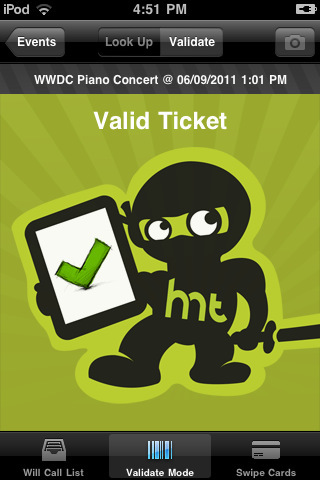 HoldMyTicket - WeGetIn®, our FREE iPhone ticket validation app is in Apple's app store! WeGetIn®, our FREE iPhone ticket validation app is in Apple's app store! We are pleased to announce that our ticket validation app is now in Apple's app store. Getting ticket holders into an event quickly is a breeze with this easy-to-use box office tool. Turn any iPod or iPhone into a powerful ticket validation and will call check-in device. This app uses the camera on an iPod or iPhone to scan barcodes on HoldMyTicket's thermal tickets, print-at-home tickets or mobile (smartphone) tickets. You can also use the app to look people up on will-call and check them in without tickets. Our free app, WeGetIn®, is downloadable in Apple's App Store, so if you have an iPhone or a new iPod Touch you?re ready to scan eTickets or hard tickets using the camera on your device. Additionally, we can equip you with a mobile scanner with a laser barcode reader and credit card swiper. This scanner runs WeGetIn® and provides the fastest scanning for high-volume entry, and effectively eliminates ticket lines. Multiple scanners can run simultaneously and communicate with each other in real time, virtually eliminating fraud. This app requires an account with HoldMyTicket.